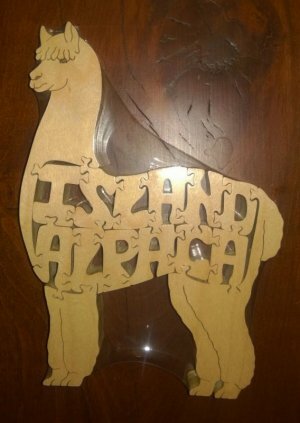 These wonderful hand-made Alpaca Puzzles are each hand cut with a scroll saw. NEW! Our wonderful puzzles are made by an Amish craftsman in northeastern Ohio who designs and cuts each and every wooden animal puzzles individually with his son! 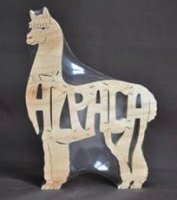 These Alpaca Puzzles are made from a quality maple or birch, using three-quarter inch thick plywood. Our new Island Alpaca Puzzles measure 7-1/4 inches tall. They are free-standing and come packaged in shrink-wrap. Easy to wrap and give as an educational gift for the alpaca enthusiast in your life! Size: 7-1/4 inches tall, 3/4 inch thick. Special Notice: Due to the nature of this product, adult supervision required for young children. If this toy or any toy ordered is intended for a young child, please assume the following warning applies: Warning: Choking Hazard due to small parts. Not intended for children under 3 years of age.